A tree’s rings help determine how long a tree lived. Because tree rings tend to look light-colored on the inside and dark-colored on the outside, the rings of dead trees tell quite a story in addition to the tree’s age. The rings also help scientists determine what kinds of events the tree went through in terms of weather and fires. Most reliable estimates of a tree’s age come from counting tree rings found in a cross-section of the trunk of the tree. Many trees produce rings annually, giving a good estimate on how long the tree grew. Sometimes trees produce more than one ring in a year. Other years, the trees produce no rings, especially if the tree experiences severe stress from weather, drought or cold. This makes the counting of tree rings somewhat problematic, especially as this system only works on dead trees. Other than looking at rings of dead trees to determine age, it’s hard to find out the age of a tree. Scientists sometimes use radiocarbon dating. Another method, the increment borer, helps scientists estimate the age of living trees by boring a small hole into the tree and removing a sample of the trunk. Scientists carefully examine the resulting core to look for clues about natural disasters that might have affected the tree and to determine the age of the tree. Tree rings from trees that started as seeds may show a truer age according to their tree rings than trees that grow from the stems or roots of other trees. Trees that grow from the root of other trees include coastal redwoods, hemlocks and a variety of fir trees. These trees often grow as nursery trees, meaning they start their lives on the downed trunk of an older tree. Sometimes the trees grow to 20 years old or more without producing a tree ring. 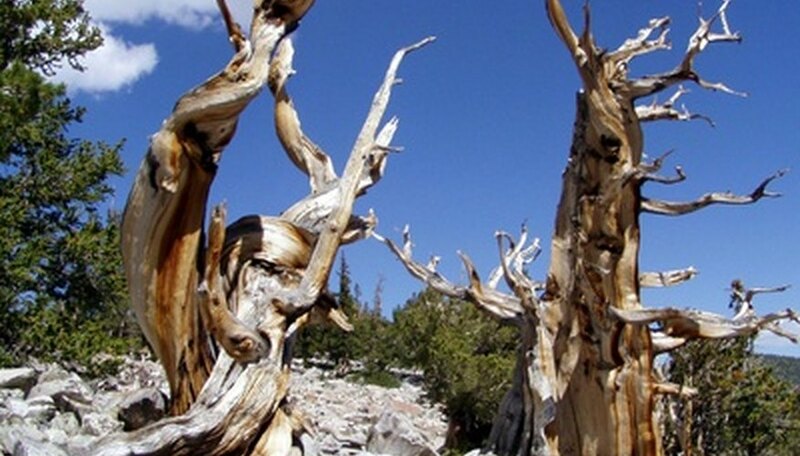 One of the oldest known trees in the world, in Great Basin National Park in Nevada, was a bristlecone pine tree named Prometheus. According to the National Park Service, when the tree died in 1964, scientists counted 4,900 growth rings. Another living bristlecone pine, in the White Mountains of California, may be 4,600 years old, making it the oldest living tree. Tree rings provide more than just the age of the tree. According to an article published by the University of Oxford, tree rings also help explain historic climate change. Scientists use carbon dating and other methods to analyze the rings of trees from kauri logs preserved in bogs in New Zealand. Some of the trees date back 130,000 years, allowing scientists to determine what happened around the last Ice Age. In California, the tree rings from giant sequoias indicate that the western Sierra Nevada area where the trees thrived went through long periods of fire and drought from 800 to 1300 B.C. The Gymnosperm Database: How Old is That Tree?